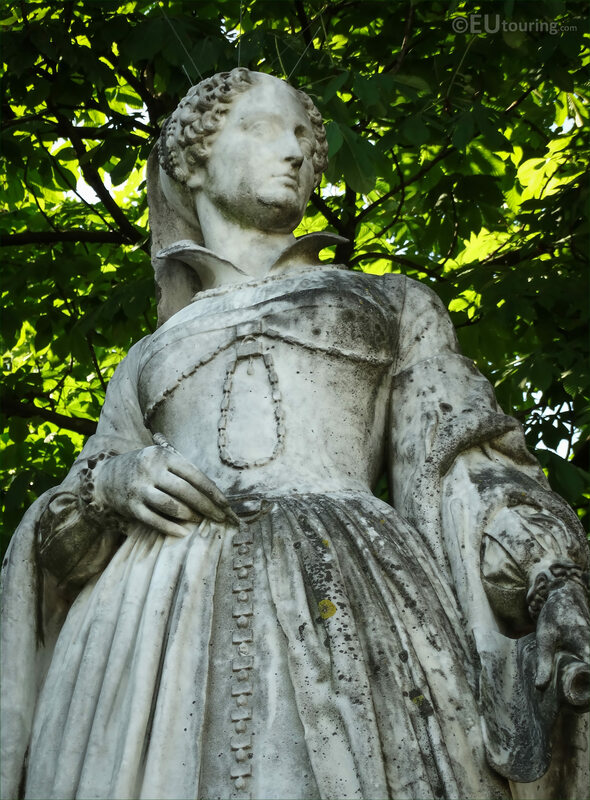 We were back within the popular tourist attraction of the Jardin du Luxembourg, located in the 6th Arrondissement of Paris, and we took these high definition photos showing the statue dedicated to the Queen of Navarre, sculpted by Jean-Louis Brian. This first HD photo shows the marble statue of Jean d'Albret, which was one the Reines de France et Femmes Illustres series of statues chosen by King Louis Philippe I to be added as ornamental decorations within the Luxembourg Gardens positioned on the terraces surround the large basin and the formal central garden. 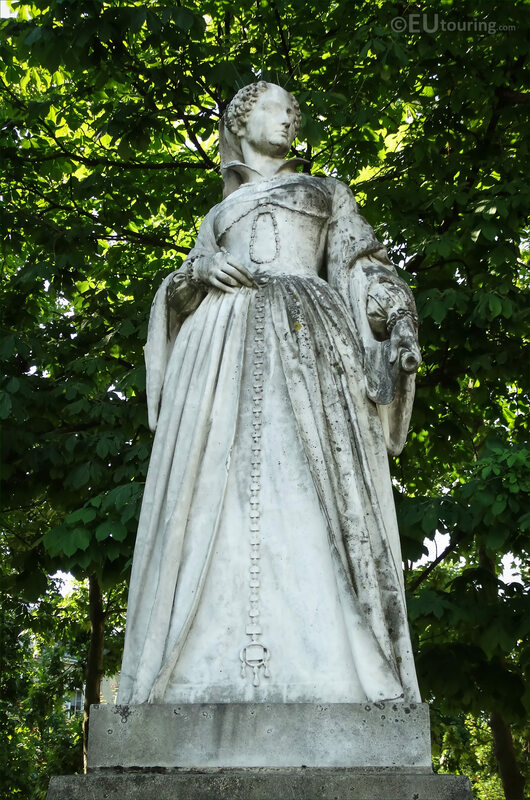 And this particular statue in the Queens of France and Famous Women series was commissioned to the artist Jean-Louis Brian, which was via a ministerial decree dated 13th June 1843, and for the sum of 12,000 French Francs, which was eventually completed in the September of 1848. So this marble statue is 2.3 metres in height, not including the pedestal, and it was produced by Jean-Louis Brian, who was born in Avignon in 1805, and being a pupil of David d'Angers, he became a French sculptor coming joint first in the 1832 Prix de Rome. And mainly working in stone or marble, this led to several different commissions for the Chateau de Versailles as well as this one for the Jardin du Luxembourg plus he executed many other, even receiving praise from the famous sculptor Auguste Rodin, yet having been affected by the disappearance of his brother after a stroke, he passed away himself only four years later in Paris in 1864. 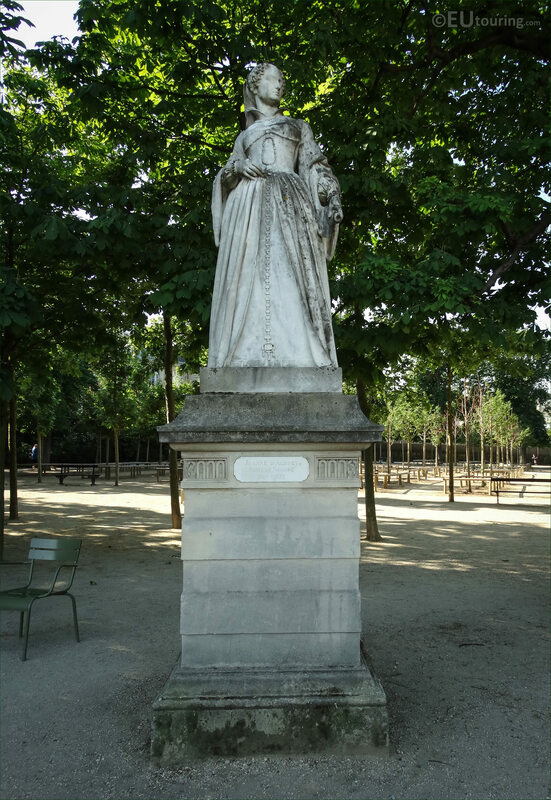 Now when it comes to Jeanne d'Albret, Reine of Navarre, she is also referred to as Jeanne III or Queen of Navarre, who was born on 7th January 1528 in Saint-Germain-en-Laye and was the daughter of Henri II, Henri d'Albret, King of Navarre and Margaret of France, also called Marguerite d'Angouleme. 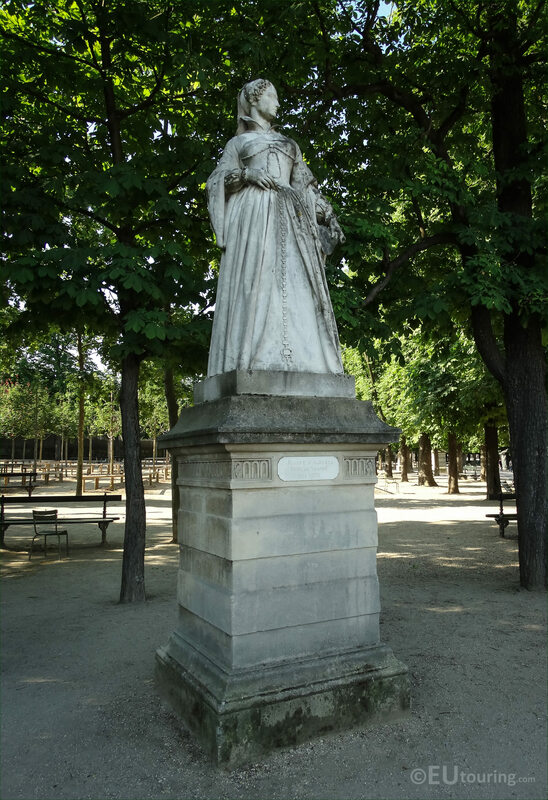 She married Antoine de Bourbon, Duke of Vendome, so by marriage Jeanne d'Albret also received the title of Duchess of Vendome and she became mother to Henry of Bourbon, who became King Henri III of Navarre and then King Henry IV of France. 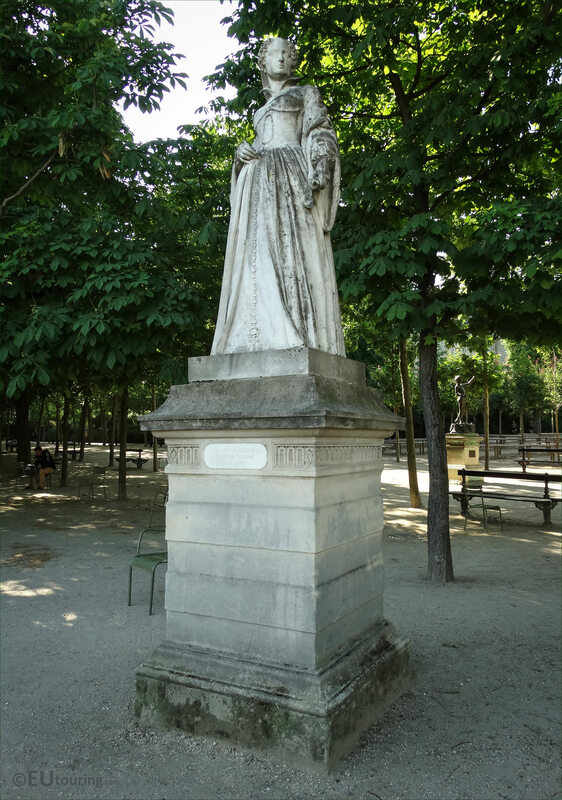 Jeanne d'Albret, Queen of Navarre was recognised for her intelligence and pride, but converting from Roman Catholic to Calvanism, she became one of the key figures in the Wars of religion, actively supporting the Huguenot cause, yet also negotiated a peace, ending the third war. However, she was sometimes called severe, both in her looks and her ways, and as you can tell from this close up photograph, the artist gave her an almost harsh face and posture, yet worthy of a strong Queen of France. 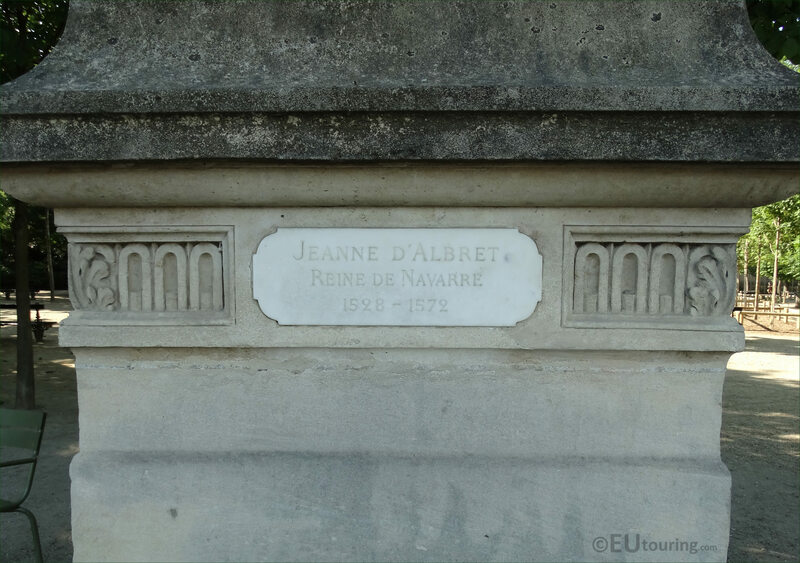 And in this last high definition photo you can see the plaque located at the front of the pedestal just below the statue of Jeanne d'Albret, Reine de Navarre, and you can also see the years of her birth and death, being 1528 - 1572.